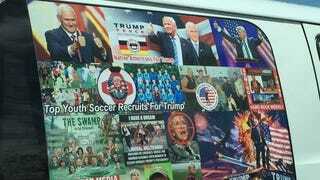 Florida man Cesar Sayoc, Jr., 56, was arrested today in the investigation of a dozen suspected mail bombs intended for George Soros, Barack Obama, the Clintons, Joe Biden, former CIA Director John Brennan, former national intelligence chief James Clapper, former Attorney General Eric Holder, Sen. Cory Booker, Rep. Maxine Waters, and Robert De Niro. Police also confiscated a white van, which apparently belongs to Sayoc and is heavily covered with graphics and text. Here are some photos taken by by a citizen that appear to correspond to images of Sayoc’s van. Perhaps you did not plan on finding the phrase “Top Youth Soccer Recruits For Trump” rattling around your brain, but there it is, now. Among the political slogans and stickers, you can also read “SOCCER RECRUITS OU WILL NEVER SEE A MORE BEAUTIFUL PLACE THAN HEAVEN BLUE NORTH CARO INA MOUNTAIN’S NORTH AND SOUTH CAROLINA COLL G E S UNSTOPPABLE DYNASTY,” along with the names of colleges in the Carolinas, repeated over and over, occasionally in list format with their NCAA rankings in various years. A man named Cesar Sayoc appears to have played 11 games for the UNC-Charlotte men’s soccer team in 1983.